1949 Gillman Map of Vegetation in Tanganyika (Tanzania). WE SELL ONLY ORIGINAL ANTIQUE MAPS - NOT REPRODUCTIONS JOIN OUR WEEKLY MAILING LIST FOR NEWEST STOCK. Title: Tanganyika Territory Vegetation Types. Description: This is a 1949 Clement Gillman map of vegetation in Tanganyika (Tanzania) The map depicts the Tanganyika Territory, modern-day Tanzania, within its contemporary borders from Lake Victoria and Kenya to Zambia, Lake Malawi, Malawi, and Mozambique and from the Rwanda, Burundi, and Lake Tanganyika to the Zanzibar Archipelago and the Indian Ocean. Using various different colors and patterns, thirteen different types of vegetation are illustrated throughout the territory. These include forest, woodland, bushland and thicket, wooded grassland, valley grassland, ridge and slope grassland, permanent swamp vegetation, desert and semi-desert, and vegetation actively induced by natives or aliens. Three different'catenas' are illustrated on the map was well. These are the Central Plateau Catena, the Ugogo Catena, and the Rain-Pond Catena. Per Gillman, who defined a catena in his paper,'A Vegetation-Types Map of Tanganyika Territory' published in Geographical Review in January 1949, a catenia is a distributional sequence of vegetation types determined by a given set of regularly repeated physiographic and/or hydrographic conditions (with their effect on soils), the arrangement of vegetation types being a function of local differences in topography that are constantly repeated over the catenary area. It will be seen that a'catena' is therefore not a category of classification as main types or subtypes are, for between one zone of the catenary complex and the nextt there is usually some principal classification line' it is merely a device to permit a more correct representation of the vegetational facts on a small-scale map than the usual misrepresentation that results from showing only a single dominant type. In other words, the catenas are areas that are more complex in their plant make up than can be adequately represented by one color on this map, according to Gillman. By using the category of'catena'. Gillman is able to illustrate a more complex area of vegetation more easily on such a small scale map. Two inset maps are included along the bottom border in the left corner. The larger of the two, entitled'Relative Reliability', depicts the reliability of the data presented on the map. High reliability' areas, Gillman states in his paper,'claim only reconnaissance status' and cober about 55% of the map. For regions that are poorly known vegetationally but are surrouned by better-known areas and possessing identical topographic features,'topographical interpolation was thought permissible'. These areas are classed as'medium reliability' and make up about 25 percent of the map. The rest of the map, 20%, can claim only'low reliability'. 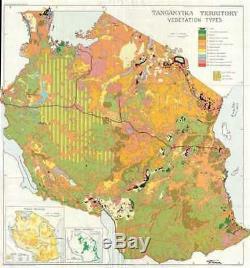 The smaller inset map depicts the distribution of the legendary baobab tree in Tanganyika. This map was Gillman's magnum opus , for which he began gathering information in 1913. It was finished in 1946 and received by the American Geographical Society a month after Gillman's death in October 1946. A first manuscript draft of the map was completed in 1944-45, on a scale of 1 : 500000 in 25 sheets or parts of sheets. For practical purposes, however, the scale had to be reduced to 1 : 2000000. This map was produced by Clement Gillman and was accompanied by a paper. Both were published in the Geographical Review by the American Geographical Society in January 1949. Size: Printed area measures 24 inches high by 22.5 inches wide. If your address is a P.
Additional Services Conservation Framing Services: Geographicus recommends basic conservation framing services for any antique paper. We do not offer this service. Antique Map Restoration Services: Geographicus can repair and restore your antique map. Services include deacidification cleaning flattening and backing. The item "1949 Gillman Map of Vegetation in Tanganyika (Tanzania)" is in sale since Thursday, September 20, 2018. This item is in the category "Antiques\Maps, Atlases & Globes\Africa Maps". The seller is "geographicusmaps" and is located in 11221. This item can be shipped worldwide.